Racist Camera gets covered in DiversityInc! Published on January 27, 2010 in humor and racist camera. 1 Comment Tags: racist camera. DiversityInc is a subscription site, so the links will probably stop working. Plus they say “Reproduction in any format is absolutely prohibited.” Well, I’m just going to excerpt, which is totally allowed. What’s going on with the Nikon CoolPix S630 digital camera? There’s a charge that its facial-recognition software fails to recognize Asian people because of their eye shapes. Read more about how one Asian consumer’s blog post brought this to the public’s attention. Wow. Sounds like I’m some sort of “consumer activist,” or something! Haha. Thanks, to Erin of VisualizAsian for the tip! Racist Camera? Does Nikon CoolPix Fail on Asian Eyes? Last year, when Joz Wang, a Taiwanese-American strategy consultant, decided to test out a new Nikon CoolPix S630 digital camera with her family members, she continually received an error message on the camera’s display screen: “Did someone blink?” After several tries with the same results, the Wangs tried taking a shot with their eyes open extra-wide. There was no error message after this attempt, they say. 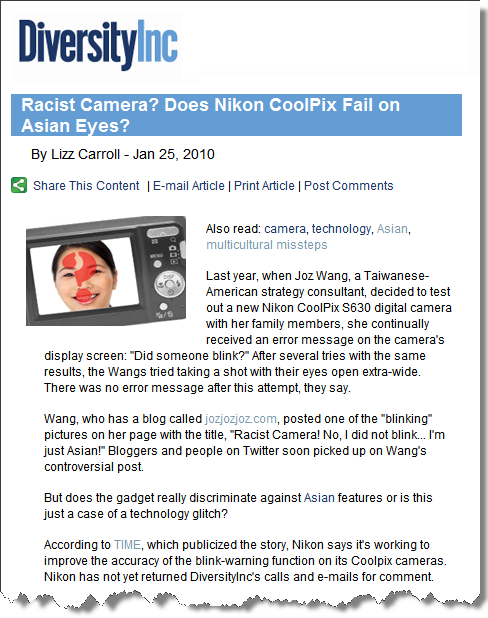 Wang, who has a blog called jozjozjoz.com, posted one of the “blinking” pictures on her page with the title, “Racist Camera! No, I did not blink… I’m just Asian!” Bloggers and people on Twitter soon picked up on Wang’s controversial post. But does the gadget really discriminate against Asian features or is this just a case of a technology glitch? According to TIME, which publicized the story, Nikon says it’s working to improve the accuracy of the blink-warning function on its Coolpix cameras. Nikon has not yet returned DiversityInc’s calls and e-mails for comment. Published on January 26, 2010 in humor and racist camera. 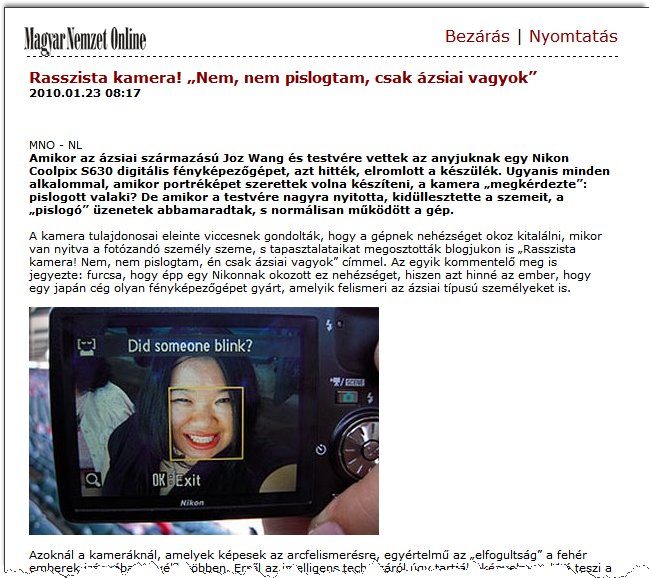 2 Comments Tags: Hungarian, nikon, racist camera, translation. Amikor az Ã¡zsiai szÃ¡rmazÃ¡sÃº Joz Wang Ã©s testvÃ©re vettek az anyjuknak egy Nikon Coolpix S630 digitÃ¡lis fÃ©nykÃ©pezÅ‘gÃ©pet, azt hittÃ©k, elromlott a kÃ©szÃ¼lÃ©k. Ugyanis minden alkalommal, amikor portrÃ©kÃ©pet szerettek volna kÃ©szÃ­teni, a kamera â€žmegkÃ©rdezteâ€: pislogott valaki? De amikor a testvÃ©re nagyra nyitotta, kidÃ¼llesztette a szemeit, a â€žpislogÃ³â€ Ã¼zenetek abbamaradtak, s normÃ¡lisan mÅ±kÃ¶dÃ¶tt a gÃ©p. A kamera tulajdonosai eleinte viccesnek gondoltÃ¡k, hogy a gÃ©pnek nehÃ©zsÃ©get okoz kitalÃ¡lni, mikor van nyitva a fotÃ³zandÃ³ szemÃ©ly szeme, s tapasztalataikat megosztottÃ¡k blogjukon is â€žRasszista kamera! Nem, nem pislogtam, Ã©n csak Ã¡zsiai vagyokâ€ cÃ­mmel. Az egyik kommentelÅ‘ meg is jegyezte: furcsa, hogy Ã©pp egy Nikonnak okozott ez nehÃ©zsÃ©get, hiszen azt hinnÃ© az ember, hogy egy japÃ¡n cÃ©g olyan fÃ©nykÃ©pezÅ‘gÃ©pet gyÃ¡rt, amelyik felismeri az Ã¡zsiai tÃ­pusÃº szemÃ©lyeket is. AzoknÃ¡l a kamerÃ¡knÃ¡l, amelyek kÃ©pesek az arcfelismerÃ©sre, egyÃ©rtelmÅ± az â€želfogultsÃ¡gâ€ a fehÃ©r emberek irÃ¡nyÃ¡ban â€“ vÃ©lik tÃ¶bben. ErrÅ‘l az intelligens technikÃ¡rÃ³l Ãºgy tartjÃ¡k, kÃ©nyelmesebbÃ© teszi a fÃ©nykÃ©pezÃ©st. Vannak olyan gÃ©pek, amelyeket Ãºgy terveztek, hogy figyelmeztessen, ha valaki pislog; mÃ¡sokat arra programoznak be, hogy automatikusan exponÃ¡ljanak, amikor valaki mosolyog â€“ ez elmÃ©letileg elavulttÃ¡ teszi azt a problÃ©mÃ¡t, hogy valaki rosszul idÅ‘zÃ­tenÃ© a kattintÃ¡st, s lemaradna a mosoly rÃ¶vid pillanatairÃ³l. Az arcÃ©szlelÃ©s a szÃ¡mÃ­tÃ³gÃ©p webkamerÃ¡jÃ¡ban lehetÅ‘vÃ© teszi, hogy egy videokonferencia alatt kÃ¶vethessÃ¼k egy szemÃ©ly mozgÃ¡sÃ¡t, de megakadÃ¡lyozhatja a szÃ¡mÃ­tÃ³gÃ©pbe valÃ³ jogtalan behatolÃ¡st is. Nem ez az elsÅ‘ eset, hogy rasszistÃ¡nak minÅ‘sÃ­tik az arcfelismerÅ‘ szoftvert. NemrÃ©g TexasbÃ³l tÃ¶ltÃ¶ttek fel a YouTube-ra egy videÃ³t, melyen egy afroamerikai megprÃ³bÃ¡lja rÃ¡venni a beÃ©pÃ­tett webkamerÃ¡t egy HP laptopon, hogy Ã©szlelje az arcÃ¡t Ã©s kÃ¶vesse mozgÃ¡sait â€“ sikertelenÃ¼l. Amikor azonban egy fehÃ©r alkalmazott prÃ³bÃ¡lkozott ugyanezzel, tÃ¶kÃ©letesen mÅ±kÃ¶dÃ¶tt a szoftver. â€žAzt hiszem, a feketesÃ©gem miatt akadÃ¡lyokba Ã¼tkÃ¶zÃ¶tt a szÃ¡mÃ­tÃ³gÃ©pâ€ â€“ mondja a videÃ³n a fÃ©rfi trÃ©fÃ¡san. â€žA HP szÃ¡mÃ­tÃ³gÃ©pek fajgyÅ±lÃ¶lÅ‘kâ€ videÃ³t majdnem 2 milliÃ³an nÃ©ztÃ©k meg vilÃ¡gszerte, Ã­gy a HP termÃ©szetesen gyorsan vÃ¡laszolt. A cÃ©g tagadja, hogy rasszista lenne a gÃ©pÃ¼k, szerintÃ¼k Å‘k mindent megtesznek, hogy jÃ³ minÅ‘sÃ©gÅ± technikÃ¡t biztosÃ­tsanak a vÃ¡sÃ¡rlÃ³iknak, etnikai megkÃ¼lÃ¶nbÃ¶ztetÃ©s nÃ©lkÃ¼l. Mindenesetre a szoftvergyÃ¡rtÃ³k tovÃ¡bb dolgoznak a â€žrasszista gÃ©pekâ€ problÃ©ma megoldÃ¡sÃ¡n. Published on January 25, 2010 in humor and racist camera. 1 Comment Tags: nikon, racist camera, Russian, translation. Hmm, it’s kind of fun seeing my name and/or picture in all these different language publications. Ð¡ÐµÐ¹Ñ‡Ð°Ñ Ñ„Ð¾Ñ‚Ð¾Ð°Ð¿Ð¿Ð°Ñ€Ð°Ñ‚Ñ‹ Ñ Ð¾Ð¿Ñ€ÐµÐ´ÐµÐ»ÐµÐ½Ð¸ÐµÐ¼ Ð»Ð¸Ñ†Ð° â€“ Ð½Ðµ Ð½Ð¾Ð²Ð¾ÑÑ‚ÑŒ. ÐÐµÐºÐ¾Ñ‚Ð¾Ñ€Ñ‹Ðµ Ð¸Ð· Ð½Ð¸Ñ… Ð¿Ñ€ÐµÐ´ÑƒÐ¿Ñ€ÐµÐ¶Ð´Ð°ÑŽÑ‚, ÐºÐ¾Ð³Ð´Ð° ÐºÑ‚Ð¾-Ñ‚Ð¾ Ð¼Ð¾Ñ€Ð³Ð½ÐµÑ‚, Ð´Ñ€ÑƒÐ³Ð¸Ðµ Ð»Ð¾Ð²ÑÑ‚ ÑƒÐ»Ñ‹Ð±ÐºÑƒ. ÐžÐ¿Ñ€ÐµÐ´ÐµÐ»ÐµÐ½Ð¸Ðµ Ð»Ð¸Ñ†Ð° Ð¸ÑÐ¿Ð¾Ð»ÑŒÐ·ÑƒÑŽÑ‚ÑÑ Ð¸ Ð² Ð²ÐµÐ±-ÐºÐ°Ð¼ÐµÑ€Ð°Ñ…, Ñ‡Ñ‚Ð¾Ð±Ñ‹ Ð¿Ð¾ÐºÐ°Ð·Ñ‹Ð²Ð°Ñ‚ÑŒ Ð»Ð¸Ñ†Ð° Ð»ÑŽÐ´ÐµÐ¹ Ð²Ð¾ Ð²Ñ€ÐµÐ¼Ñ Ð²Ð¸Ð´ÐµÐ¾ ÐºÐ¾Ð½Ñ„ÐµÑ€ÐµÐ½Ñ†Ð¸Ð¹ Ð¸Ð»Ð¸ Ð² ÑÐ¸ÑÑ‚ÐµÐ¼Ð°Ñ… Â«ÑƒÐ·Ð½Ð°Ð²Ð°Ð½Ð¸ÑÂ», Ñ‡Ñ‚Ð¾Ð±Ñ‹ Ð½Ðµ Ð´Ð¾Ð¿ÑƒÑÑ‚Ð¸Ñ‚ÑŒ Ð½ÐµÑÐ°Ð½ÐºÑ†Ð¸Ð¾Ð½Ð¸Ñ€Ð¾Ð²Ð°Ð½Ð½Ñ‹Ð¹ Ð´Ð¾ÑÑ‚ÑƒÐ¿. ÐŸÑ€Ð¸Ð½Ñ†Ð¸Ð¿ Ð´ÐµÐ¹ÑÑ‚Ð²Ð¸Ñ Ð¿Ñ€Ð¾ÑÑ‚Ð¾Ð¹: Ñƒ Ð±Ð¾Ð»ÑŒÑˆÐ¸Ð½ÑÑ‚Ð²Ð° Ð»ÑŽÐ´ÐµÐ¹ Ð´Ð²Ð° Ð³Ð»Ð°Ð·Ð°, Ð¾Ð´Ð¸Ð½ Ð½Ð¾Ñ, Ð¾Ð´Ð¸Ð½ Ñ€Ð¾Ñ‚, Ð°Ð»Ð³Ð¾Ñ€Ð¸Ñ‚Ð¼ Ð¸Ñ‰ÐµÑ‚ ÑÑ‚Ð¸ Ñ‡ÐµÑ€Ñ‚Ñ‹, Ð° Ð´Ð°Ð»ÑŒÑˆÐµ Ð²Ñ‹Ð¿Ð¾Ð»Ð½ÑÐµÑ‚ Ð¿Ð¾ÑÑ‚Ð°Ð²Ð»ÐµÐ½Ð½ÑƒÑŽ Ð·Ð°Ð´Ð°Ñ‡Ñƒ. ÐžÐ´Ð½Ð°ÐºÐ¾ Ð¿Ð¾Ð»ÑŒÐ·Ð¾Ð²Ð°Ñ‚ÐµÐ»Ð¸ ÑÑ‚Ð°Ð»Ð¸ Ð·Ð°Ð¼ÐµÑ‡Ð°Ñ‚ÑŒ, Ñ‡Ñ‚Ð¾ Ñ†Ð¸Ñ„Ñ€Ð¾Ð²Ð°Ñ Ñ‚ÐµÑ…Ð½Ð¸ÐºÐ° Ð²Ñ‹ÐºÐ°Ð·Ñ‹Ð²Ð°ÐµÑ‚ Ð¿Ñ€ÐµÐ´Ð¿Ð¾Ñ‡Ñ‚ÐµÐ½Ð¸Ðµ ÐµÐ²Ñ€Ð¾Ð¿ÐµÐ¾Ð¸Ð´Ð½Ð¾Ð¼Ñƒ Ñ‚Ð¸Ð¿Ñƒ Ð»Ð¸Ñ†Ð°. Ð¢Ð°Ðº, Ð”Ð¶Ð¾Ð· Ð’Ð°Ð½Ð³ (Joz Wang) ÐºÐ¾Ð½ÑÑƒÐ»ÑŒÑ‚Ð°Ð½Ñ‚ Ñ‚Ð°Ð¹Ð²Ð°Ð½Ð¾-Ð°Ð¼ÐµÑ€Ð¸ÐºÐ°Ð½ÑÐºÐ¾Ð¹ ÐºÐ¾Ð¼Ð¿Ð°Ð½Ð¸Ð¸, Ð¿Ð¾Ð´Ð°Ñ€Ð¸Ð² Ñ†Ð¸Ñ„Ñ€Ð¾Ð²Ð¾Ð¹ Ñ„Ð¾Ñ‚Ð¾Ð°Ð¿Ð¿Ð°Ñ€Ð°Ñ‚ Nikon Coolpix S630 ÑÐ²Ð¾ÐµÐ¹ Ð¼Ð°Ð¼Ðµ Ð½Ð° Ð”ÐµÐ½ÑŒ Ð¼Ð°Ñ‚ÐµÑ€Ð¸, Ð¾Ð±Ð½Ð°Ñ€ÑƒÐ¶Ð¸Ð»Ð°, Ñ‡Ñ‚Ð¾ ÐºÐ¾Ð³Ð´Ð° Ð¾Ð½Ð¸ Ð¿Ñ‹Ñ‚Ð°Ð»Ð¸ÑÑŒ Ñ„Ð¾Ñ‚Ð¾Ð³Ñ€Ð°Ñ„Ð¸Ñ€Ð¾Ð²Ð°Ñ‚ÑŒ ÑƒÐ»Ñ‹Ð±Ð°ÑŽÑ‰Ð¸ÐµÑÑ Ð»Ð¸Ñ†Ð° ÑÐ²Ð¾Ð¸Ñ… Ð´Ñ€ÑƒÐ·ÐµÐ¹ Ð¸ Ñ€Ð¾Ð´Ð½Ñ‹Ñ…, ÐºÐ°Ð¼ÐµÑ€Ð° Ð¿Ñ€ÐµÐ´ÑƒÐ¿Ñ€ÐµÐ¶Ð´Ð°Ð»Ð°: ÐºÑ‚Ð¾-Ñ‚Ð¾ Ð¼Ð¾Ñ€Ð³Ð½ÑƒÐ». ÐžÐ½Ð° Ð¿Ð¾Ð¼ÐµÑÑ‚Ð¸Ð»Ð° Ñ„Ð¾Ñ‚Ð¾ Ñ ÑÐ¾Ð¾Ð±Ñ‰ÐµÐ½Ð¸ÐµÐ¼ Ð² ÑÐ²Ð¾ÐµÐ¼ Ð±Ð»Ð¾Ð³Ðµ Ð¿Ð¾Ð´ Ð·Ð°Ð³Ð¾Ð»Ð¾Ð²ÐºÐ¾Ð¼ Â«Ð Ð°ÑÐ¸ÑÑ‚ÑÐºÐ°Ñ ÐºÐ°Ð¼ÐµÑ€Ð°! ÐÐµÑ‚, Ñ Ð½Ðµ Ð¼Ð¾Ñ€Ð³Ð°ÑŽ… Ð¯ Ð¿Ñ€Ð¾ÑÑ‚Ð¾ Ð°Ð·Ð¸Ð°Ñ‚ÐºÐ°!Â» Ð’ ÐºÐ¾Ð¼Ð¼ÐµÐ½Ñ‚Ð°Ñ€Ð¸ÑÑ… Ðº ÑÐ½Ð¸Ð¼ÐºÑƒ ÐµÑÑ‚ÑŒ Ñ‚Ð°ÐºÐ¾Ð¹: Â«ÐœÐ¾Ð¶Ð½Ð¾ Ð±Ñ‹Ð»Ð¾ Ð¿Ð¾Ð´ÑƒÐ¼Ð°Ñ‚ÑŒ, Ñ‡Ñ‚Ð¾ Â«ÐÐ¸ÐºÐ¾Ð½Â», ÑÐ°Ð¼ Ð±ÑƒÐ´ÑƒÑ‡Ð¸ ÑÐ¿Ð¾Ð½ÑÐºÐ¾Ð¹ ÐºÐ¾Ð¼Ð¿Ð°Ð½Ð¸ÐµÐ¹, Ñ€Ð°Ð·Ñ€Ð°Ð±Ð¾Ñ‚Ð°ÐµÑ‚ ÑÑ‚Ð¾, ÑƒÑ‡Ð¸Ñ‚Ñ‹Ð²Ð°Ñ Ð³Ð»Ð°Ð·Ð° Ð°Ð·Ð¸Ð°Ñ‚Ð¾Ð²Â». Â«ÐÐ¸ÐºÐ¾Ð½Â» Ð½Ðµ ÐµÐ´Ð¸Ð½ÑÑ‚Ð²ÐµÐ½Ð½Ñ‹Ð¹, ÐºÐ¾Ð³Ð¾ Ð¾Ð±Ð²Ð¸Ð½ÑÑŽÑ‚ Ð² Ñ€Ð°ÑÐ¸Ð·Ð¼Ðµ. ÐÐ°Ð¿Ñ€Ð¸Ð¼ÐµÑ€, Ð² Ð¿Ñ€Ð¾ÑˆÐ»Ð¾Ð¼ Ð³Ð¾Ð´Ñƒ Ð½Ð° YouTube ÑÐ¾Ñ‚Ñ€ÑƒÐ´Ð½Ð¸Ñ†Ð° Ð¾Ð´Ð½Ð¾Ð¹ Ð¸Ð· Ñ‚ÐµÑ…Ð°ÑÑÐºÐ¸Ñ… ÐºÐ¾Ð¼Ð¿Ð°Ð½Ð¸Ð¹ Ð²Ñ‹Ð»Ð¾Ð¶Ð¸Ð»Ð° Ð²Ð¸Ð´ÐµÐ¾, ÐºÐ°Ðº ÐµÐµ Ñ‡ÐµÑ€Ð½Ñ‹Ð¹ ÐºÐ¾Ð»Ð»ÐµÐ³Ð° Ð¿Ñ‹Ñ‚Ð°ÐµÑ‚ÑÑ Ð½Ð°ÑÑ‚Ñ€Ð¾Ð¸Ñ‚ÑŒ Ð²ÐµÐ±-ÐºÐ°Ð¼ÐµÑ€Ñƒ Ð² Ð¿Ð°Ð²Ð¸Ð»ÑŒÐ¾Ð½Ðµ Hewlett-Packard, Ñ‡Ñ‚Ð¾Ð±Ñ‹ Ð¾Ð½Ð° Ð¾Ð¿Ñ€ÐµÐ´ÐµÐ»Ð¸Ð»Ð° ÐµÐ³Ð¾ Ð»Ð¸Ñ†Ð¾ Ð¸ Ð¾Ñ‚ÑÐ»ÐµÐ¶Ð¸Ð²Ð°Ð»Ð° ÐµÐ³Ð¾ Ð´Ð²Ð¸Ð¶ÐµÐ½Ð¸Ñ. ÐÐ° ÐµÐ³Ð¾ Ð±ÐµÐ»ÑƒÑŽ ÐºÐ¾Ð»Ð»ÐµÐ³Ñƒ ÐºÐ°Ð¼ÐµÑ€Ð° Ñ€ÐµÐ°Ð³Ð¸Ñ€Ð¾Ð²Ð°Ð»Ð° ÐºÐ¾Ñ€Ñ€ÐµÐºÑ‚Ð½Ð¾, Ð° Ð²Ð¾Ñ‚ Ñ‡ÐµÑ€Ð½Ð¾Ð³Ð¾ ÑÐ¾Ñ‚Ñ€ÑƒÐ´Ð½Ð¸ÐºÐ° Ð¸Ð³Ð½Ð¾Ñ€Ð¸Ñ€Ð¾Ð²Ð°Ð»Ð°. ÐŸÑ€Ð¾Ð¸Ð·Ð²Ð¾Ð´Ð¸Ñ‚ÐµÐ»Ð¸ Ñ‚ÐµÑ…Ð½Ð¸ÐºÐ¸ Ð¾Ð±ÐµÑ‰Ð°ÑŽÑ‚, Ñ‡Ñ‚Ð¾ Ð²ÑÐºÐ¾Ñ€Ðµ Ð¸Ñ… Ñ‚ÐµÑ…Ð½Ð¸ÐºÐ° Ð±ÑƒÐ´ÐµÑ‚ Ñ€Ð°ÑÐ¿Ð¾Ð·Ð½Ð°Ð²Ð°Ñ‚ÑŒ Ð»Ð¸Ñ†Ð° Ð´Ð°Ð¶Ðµ ÑÐ¸Ð½ÐµÐºÐ¾Ð¶Ð¸Ñ… Ð¾Ð±Ð¸Ñ‚Ð°Ñ‚ÐµÐ»ÐµÐ¹ ÐŸÐ°Ð½Ð´Ð¾Ñ€Ñ‹ Ð¸Ð· Ñ„Ð¸Ð»ÑŒÐ¼Ð° Â«ÐÐ²Ð°Ñ‚Ð°Ñ€Â». Published on January 24, 2010 in humor and racist camera. 2 Comments Tags: chinese, nikon, racist camera, translation. 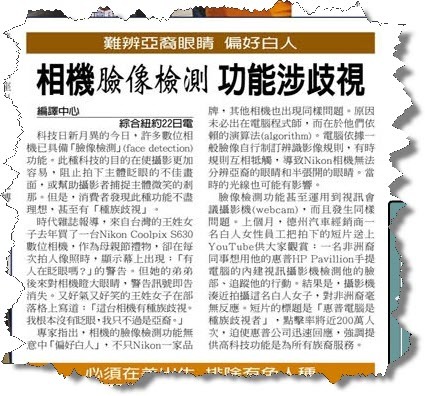 Move over, Time Magazine… My Auntie called my Mom and says she saw the Racist Camera in the Chinese Daily News/World Journal (ä¸–ç•Œæ–°èžç¶²). Now I’m legit, says Mom. Haha. Thus began my evening of looking for the article for Mom. Of course, they didn’t print the picture, so I actually had to do a little bit of “reading” to find it. Published on January 22, 2010 in humor and racist camera. 7 Comments Tags: CPAF, Danny Cho, nikon, racist camera, Time Magazine. 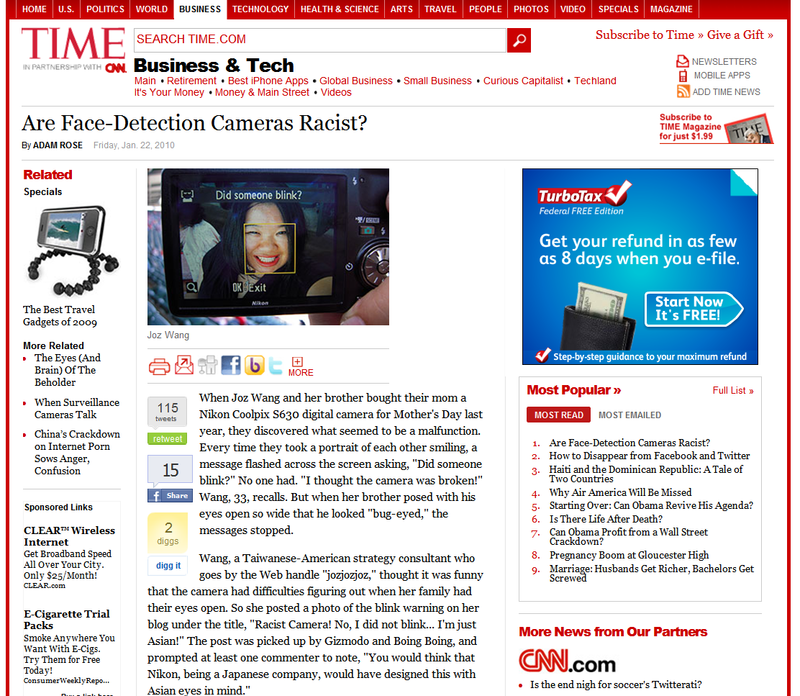 So the infamous Racist Camera picture is in the news today, thanks to an interview I did with Time Magazine. The story was also featured on the front page of Yahoo and is making the twitter/Facebook/digg/etc rounds again. Margaret Cho read the article and made a more serious post on her blog. And most importantly, I gave Moye an exclusive interview and she posted it in on 8Asians.com!!! I DO NOT ACTUALLY THINK THE CAMERA IS RACIST! I DO NOT ACTUALLY THINK NIKON IS A RACIST COMPANY! < ---- LOOK AT THIS! But whatever, if I've actually gained any traffic today, then I will put it toward a good cause. Today is the last day of the Facebook/Chase Community Giving campaign & I would encourage you to please take 10 seconds to vote for the Center for the Pacific Asian Family at voteCPAF.org! If my asking you nicely to vote doesn't convince you, what about if Kim Jong-Il makes the request?! Published on May 18, 2009 in General. 6 Comments Tags: nikon, racist camera. My awesome friends and family keep sending me links of where they are coming upon my now infamous “Racist Camera” picture. My brother, who doesn’t read my blog and who refuses to join any/all social networks, sent me a link he saw on some tech site he reads. An old high school friend that I haven’t seen in decades (he is currently serving in military and is the Middle East) saw it on Gizmodo. My cousins have emailed me links, too. What’s really weird is that none of these people read my blog, not that there’s much to read these days. 1) Has Nikon attempted to contact me yet? Nope. I’m still waiting. 2) Do I really think the Nikon S630 is a “racist camera?” What do YOU think?! 3) Did you have any idea that your picture would be posted all over the place? No, and if I had, I wish I’d had a better plan as to how to use all the attention for good. Or at least get a couple of bucks out of the whole shebang. Now, I’m off to take a shower and go to bed. UPDATE: Wow, people who don’t know me seem to be getting the impression that I’m actually “unhappy” that I’m not “cashing in.” Or that I’m actually wanting tips on how to do so. Longtime readers know that if I’d wanted to make $ on my blog, I’d have tried to a long time ago. The jozjozjoz.com archives for the racist-camera tag.